Twelve carriages, a few thousand passengers, but who says go? Heading back to the MTR East Rail theme from a week ago, lets see how the MTR manages to operate an intensive rapid transit service on a railway alignment that dates back 100 years. 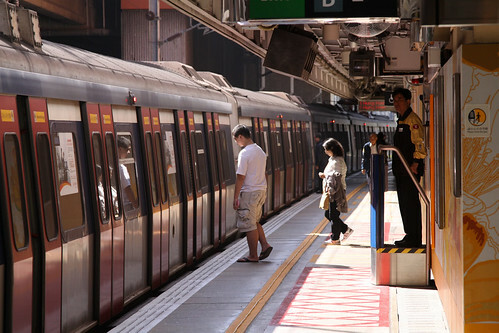 East Rail is the last MTR line without platform screen doors or gates, and when added to the massive size of the trains – 12 carriages and 290 metres long – how does one know when it is safe for a a train to depart? 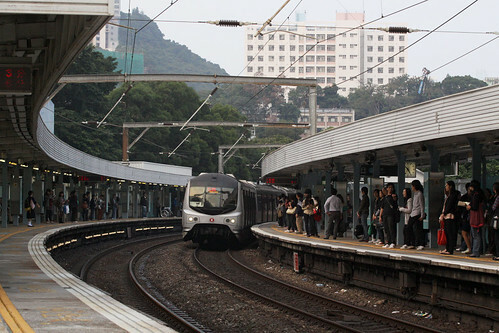 The main challenge of the MTR is the sheer number of passengers that use the line, with huge crowds of intending passengers forming at major interchange stations – each train has a total capacity of over 3700 passengers. Making things even worse is the curved platforms at the majority of stations, making looking down an entire 12-car long train impossible. University station has the sharpest curve, with Mong Kok East coming a close second. About the only redeeming factor for the line is the precision stopping of trains at platforms, and the common door spacing in all carriages. This has allowed queuing lines to be painted onto the platform, so that passengers can line up ready for the next train to arrive. Around Australia there are various systems used to clear trains for departure. Brisbane has two person crews on their 6-car long trains: a driver who drives, and a guard who closes the doors when they see the doors are clear. Sydney uses 8-car long double deck trains with two person crews: bell codes are used to tell the driver when to depart. At curved platforms the guard is assisted by station staff who use flags to indicate ‘right of way’ to the guard. 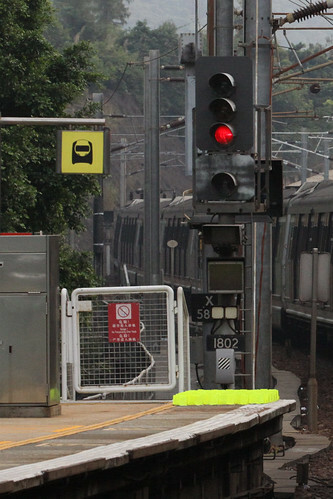 Melbourne has driver only trains: guards on suburban trains were abolished in the mid-1990s. CCTV monitors and mirrors on platforms are provided for drivers to see if the doors are clear, in the past year station staff have been provided with light up paddles to indicate to drivers that the doors are clear. Perth has driver only trains: CCTV monitors inside the cab are linked to cameras on the platform so that drivers can see if the doors are clear. Adelaide has driver only trains: however on busier services a passenger service assistant (PSA) travels on the train to operate the doors, and to give a proceed signal to the driver. Adelaide Railway Station also has platform coordinators to give drivers a departure signal. 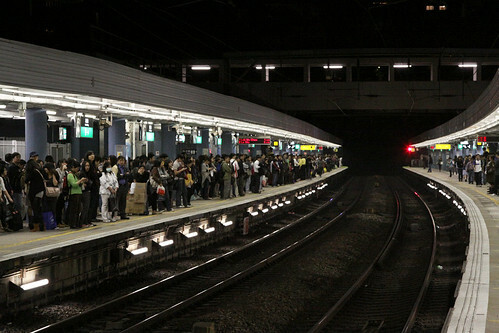 In short, a railway can provide a second person on every train to work the doors, or provide some form of system so that the driver can do it themselves. The Melbourne experience seems to suggest that the second method does not scale well when platforms get busier. 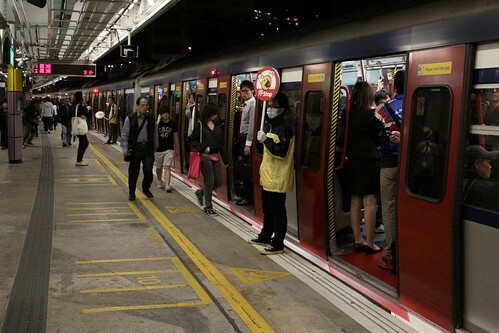 So what does the MTR do with the heavily used East Rail line? Each of their EMUs operate with only a single train operator who drives and closes the doors, but staff are positioned on platforms to determine when it is safe for the train to depart. 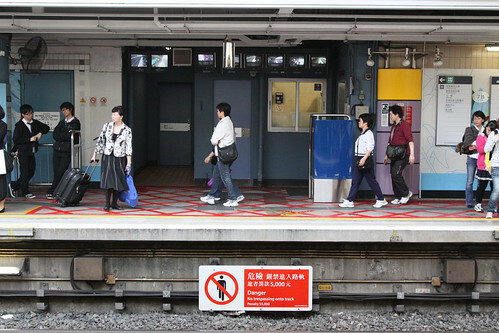 To assist with passenger flows during peak times, the busier stations have additional platform attendants located near the main entrances to the platform. Their task is to hold up a ‘stop’ sign to arriving passengers, in an attempt to prevent them from running at the doors just before the train is due to depart. 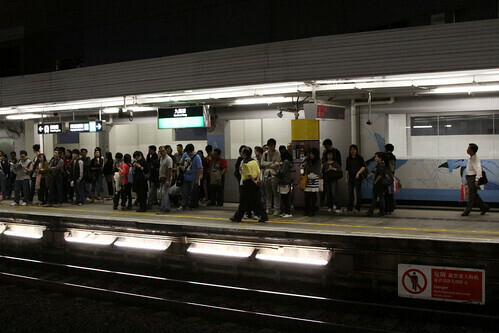 Each platform supervisor is in charge of train departures from their platform. They stand in the passenger area atop a podium, opposite a bank of CCTV monitors which are linked to an array of cameras located along the platform. After ensuring that the doors are clear via the CCTV monitors, they turn a keyswitch on their console, which then illuminates a ‘close doors’ symbol for the driver. The departure indication is displayed to the driver by a LED array at the departure end of the platform, alongside the departure signal and a headway clock. 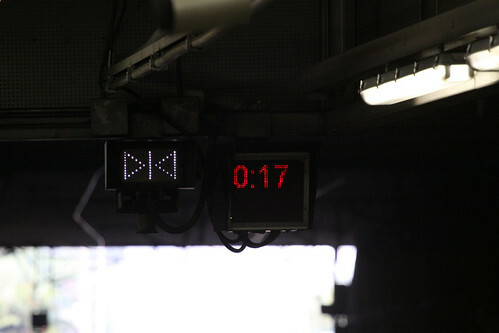 This clock is provided for the train driver to ensure they depart on time, and counts down in seconds until the scheduled departure time, then begins counting upwards in seconds until the train leaves the platform. The yellow sign overhanging the platform edge is a stopping mark indicator – it took me about two weeks to work out what the sign actually meant, because I kept on seeing it as an odd looking XBox game controller, not an outline of a train! 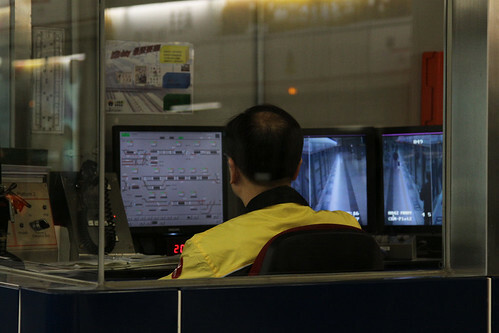 In all, the MTR East Rail line is an extremely efficient operation, with only a small number of staff needed to sure the safe transport of the massive numbers of passengers that use it. 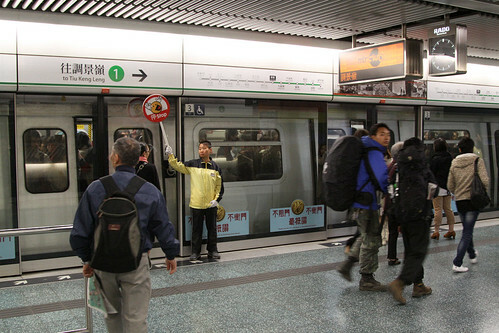 This entry was posted in Transport and tagged Hong Kong, Mass Transit Railway, MTR, rail operations, trains. Bookmark the permalink. 7 Responses to Twelve carriages, a few thousand passengers, but who says go? You should do a blog post about platform attendants. Once I saw an attendant wave the stop sign in someone’s face to stop them. The platform attendants I’ve seen were a lot more restrained! It’d be interesting to see if the Platform Assistants with the bank of CCTV cameras will be retained after APGs are installed and shorter trains rolled in.